In the overall scheme of a bathroom, the sink faucet might seem like an incidental detail, but its design can set the tone for the whole space. If it’s been a while since you last shopped for a faucet, you’ll be amazed by the broad range of styles, finishes, and state-of-the-art functions available today. Buying only one from a field of so many options may seem daunting. 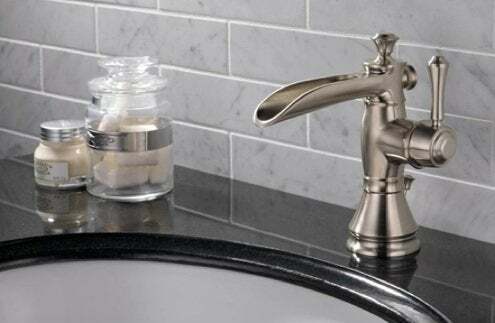 Allison McKinney, a product manager at Delta Faucets, says that “the three main considerations when choosing a new faucet are style, function, and fit.” Indeed, zeroing in on these criteria helps simplify the selection process. Are you updating an old sink or planning a complete bathroom remodel? If you’re focusing on the sink, your choices will be somewhat limited, since the faucet will need to fit into the existing setup (ideally, it will coordinate with other fixtures in the room). If you are redoing the entire room, all avenues are open. Curvy or sleek, one handle or two, there are truly styles to fit any taste. Once you’ve honed in on a silhouette you like, next you will need to decide on a finish. Do you prefer traditional chrome or something a little unexpected, such as old-rubbed bronze? McKinney reminds renovators: No matter what shape and finish you love, be sure the faucet has matching tub and shower fixtures so that you can complete the whole room. If you want a faucet with no bells and whistles, take your pick—there’s no shortage on the market. But a lot has changed in faucet technology over the past decade, so you may find it worthwhile, not to mention fun, to see what’s out there. Popular now are hands-free designs that use motion sensors to turn on and off automatically. (These are a great option for households with young children who tend to leave the water running.) Or maybe a luxurious waterfall flow is just what you’ve dreamed about for your new master bath. Before visiting a showroom, consider your lifestyle and the amount of use the new faucet is likely to receive. A more decorative style better suits a powder room used mainly by guests, while your high-traffic kids bath may warrant a sturdier choice. Whereas style and function are often a matter of personal taste, “fit” is the technical part of the equation that will be of particular importance if you are replacing the faucet on an existing sink. Single-hole sinks fit either single-handled or smaller two-handled faucets. Centerset (also called mini-widespread) sinks feature three holes drilled within four inches and accommodate single-handled desins or two-handled faucets mounted on a plate or escutcheon. Widespread sinks, which have three separate holes at least eight inches apart, accept larger two-handled designs. Wall-mounted designs are also available. 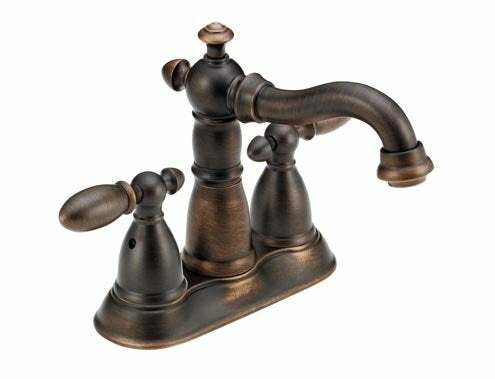 If replacing an old faucet, be sure to bring a picture and dimensions of your sink to a showroom. Prices vary from about $50 to more than $500, depending on style, finish, and technology. Have a budget in mind before you begin your search and realize that to get the look you want, it may be necessary to compromise. Affording a hands-free design, for instance, may mean opting for a less expensive finish. Inquire how the finish on a faucet was applied, as this usually affects price. So-called PVD (Physical Vapor Deposition) coating is extremely durable but costs more. Also, note that warranties on faucets (for both finishes and inner valve construction) are usually worthwhile. Before you begin your search, take a picture of the sink you plan to update, jotting down its dimensions and hole configurations. Or if you’re renovating the space in its entirety, collect pictures of dream bathrooms and fixtures to develop a sense of what you like. Installing the faucet yourself? Ask which models have the greatest ease of installation. “Bring all the information you can with you to the showroom, so there are no surprises when you get there,” McKinney concludes.